This is a story a long time in coming. My first view of the car that was to become Time Machine was in 1999 on my 1st date with Crystal (who was to become my wife, best friend, and car muse). I remember thinking, "Cool! A woman with taste in cars!" Fast forward to August 2001, and the decision to get Crys something that wasn't a bobsled in winter weather (Yes, she was driving it!). The folks at the local Chevy store for some reason were NOT interested in taking the Trans Am in trade, which I thought was odd (Afraid they were of a typically beat up muscle car, I think) Thanks, Yoda! Anyway, we were driving home in our new Blazer, and I was thinking what to do with the TA. It was at this point that Crystal hands me the keys to it and says, "here ya go". To say I was pleased would be an understatement. I drove it occasionally in it's stock form for 8 years, then an incident which set into effect a chain of events that I could not have possibly foreseen. My daily driver had a slight electrical issue, and I couldn't drive it to work that night. So, I pull the T/A out and go. In the Overbrook neighborhood of Pittsburgh, I lost my concentration and slightly boinked the curb, which is on the same vertical plane as the associated guardrail, placing two long dents down the passenger side. Well, Crys & I had been talking about re-doing the T/A , so this provided the motivation to start. However, what started to be just a repair/repaint gathered up a life of its own, and before I knew it, I was seeing things I wanted to do to the car, and things that needed attention since it did have almost 90K miles on her. On May 10, 2009, I started on what was to be my Magnum Opus. 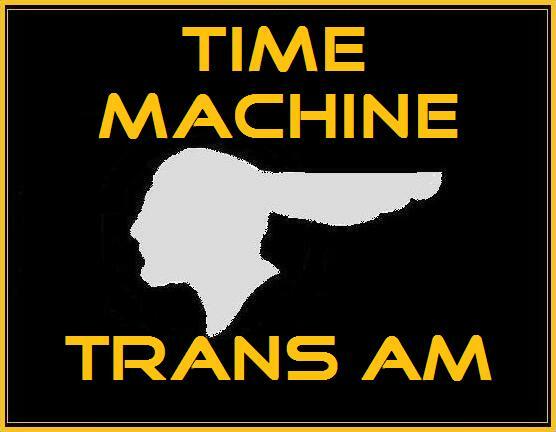 I was seeing a lot of stuff on older Trans Ams that would look good on our car. The '77 shaker hood was really the thing that got it going. After that, a stream of styling cues from the past started to appear on her. And that's when the name came to me. Now I am going to do the rebuilding that the car needs. Suspension rebuild, brake upgrades, and such. But I have more than just appearance mods in mind. Since she's a convertible, she'll never be a corner-carver. But I do plan to make changes to the chassis and brake system to allow her to show a bit more of her performance DNA. And I'll basically optimize the engine in order to get the most out of her. The fact that she carries PA Classic plates allows me some leeway in this area, since I no longer have an emission inspection to deal with. The last thing is the dedication. The Time Machine is dedicated to my late father, Robert N. Hindle. He is the guy who insisted on having me "help" him any time he was working on a car. (mostly as a tool boy) But I learned a lot from him, from bodywork to chassis stuff to re-building engines. If you look at the "Dedication" page, you'll see how this manifested itself. So to those who have stayed with me during this intro, thanks and I hope you'll check out the site in its entirety. I do keep up with updates, so there's usually something new to see every week.